Though commonly known as a ‘fern’ because of its delicate fern-like leaves, this beautiful ornamental asparagus is not in any way related to it. Instead, Asparagus densiflorus ‘Sprengeri’ belongs to the Lily family, and is much easier to grow than ferns that are fragile and quite demanding. A popular plant that will look its best if grown in a hanging basket or container, with its slender and cascading stems that are covered with emerald-green needle-like foliage, billowing gracefully in the breeze. An ideal groundcover plant for the border too since it is dense, mounding and spreading in nature. This herbaceous plant will be more captivating when it’s covered with white flowers and vibrant red berries as seen in images at Dave’s Garden. An outstanding contrast against the green foliage. 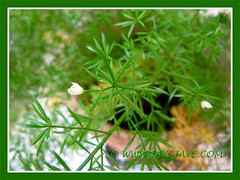 A wonderful foliage plant that is extremely versatile and most desirable to have in the garden. 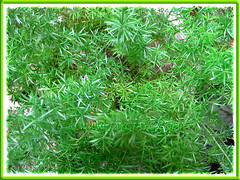 Common Name: Sprengeri Asparagus Fern, Asparagus Fern, Emerald Fern, Basket Asparagus, Plume Asparagus, Foxtail Fern. Etymology: The genus name, Asparagus is derived from the Greek Asparagos for the cultivated asparagus and also possibly derived from ‘sparassa‘, meaning to tear, referring to the sharp spines found on many species. The species epithet densiflorus refers to the small flowers that are densely packed along its stem. Origin: Native of South Africa, but widely cultivated worldwide as an ornamental. Plant type: An ornamental herbaceous perennial. Features: Asparagus densiflorus ‘Sprengeri’ is an attractive species of the genus, Asparagus which comprises of about 300 species. It is popularly used in the landscape for its beautiful display of rich-green and fern-like foliage. An evergreen herbaceous perennial that grows rapidly to about 30-60 cm tall and spreads to 1 m across. It is mounding, sprawling and trailing in nature. The stems that emerge directly from the fleshy tuberous roots in the ground are wiry and arching, clumping and bears very small and inconspicuous thorns, unlike most Asparagus species that have large or sharp spines. Its true leaves are scale-like and hardly noticeable. 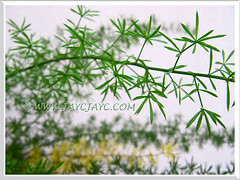 The dense green foliage with a delicate and airy appearance will gradually wither to yellow and then brown. 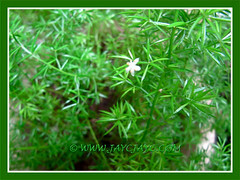 A mature plant will bear tiny and inconspicuous white flowers that emerge in axillary racemes, periodically through the year. These short-lived blooms that are sweetly fragrant will be followed by clusters of green ovoid fruits that will ripen into vibrant red berries, each about 1.25 cm long. These attractive red berries that contain one to two hard, black seeds are enjoyed by birds that help distribute the seeds and multiply the Sprengeri Asparagus Fern in the landscape, making it potentially invasive. 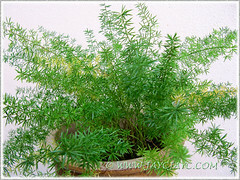 Culture (Care): Asparagus densiflorus ‘Sprengeri’ is a robust and low-maintenance plant that grows easily. Light: Full sun to light shade (under 25% shade) for best growth and colour. Moisture: Medium water requirements. Water thoroughly and allow soil to dry out a little between waterings. 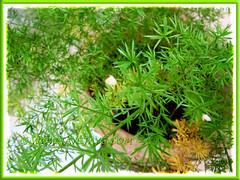 Since the plant has fleshy tuberous roots that store water, it is moderately drought tolerant. However, prolonged dryness at the roots can cause leaf drop. It loves humid conditions. Soil: Adaptable to many soil types (clayey or sandy loam) but prefers well-drained soils and enriched with organic matter. 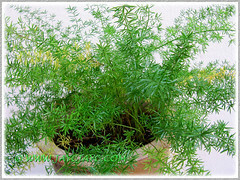 Others: Feed Asparagus densiflorus ‘Sprengeri’ once monthly with a foliage houseplant fertilizer to keep them healthy and vigorous. To maintain a pleasing appearance and rejuvenate plants, cut back old straggly growth or overgrown ones and prune off withered stalks to keep tidy. Do be careful when handling the plant as the thorns and sap from the stems are known to cause irritation to some people. Red berries are poisonous and may cause gastrointestinal problems if ingested. Spider mites can be a problem, otherwise almost pest and disease free. Being hardy and robust, the Sprenger’s Fern can be weedy and invasive when escape from cultivation. Hence, the Asparagus densiflorus ‘Sprengeri’ has been classified as an invasive species by Florida Exotic Pest Plant Council and in Australia, New Zealand, Hawaii and elsewhere as cited by Pacific Island Ecosystems at Risk (PIER). For subtropical and temperate regions: Hardiness: USDA Zone 9-11. Winter hardy to 20°F (-6.6°C). It recovers quickly if frozen to the ground. This plant is more suitable to be grown in locations protected from frost in temperate climates. 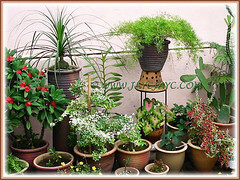 Outdoors, it is advisable to grow as a container plant because the plant tends to spread extensively when grown on the ground. Water the plant thoroughly during the growing season, but avoid waterlogging that may result in root rot. Water sparingly in winter, being mindful not to be overly dry or else will result in a lot of leaf drop. Feed once monthly in spring through fall with a balanced houseplant fertilizer. Indoors as a houseplant, mist regularly or set the pot on a tray of wet pebbles as it prefers a humid environment. Propagate them in spring or early summer, and repot in spring if it becomes root bound. Propagation: By division of root ball and by seeds which germinate in about 3-6 weeks. Usage: Asparagus densiflorus ‘Sprengeri’ grows well in containers, especially in hanging pots or raised on a decorative metal flower pot stand to enhance its cascading beauty. It will look good too as a perfect complement to flowery companions and other foliage plants. Having a sprawling habit, the Emerald Fern will make an excellent garden or landscape plant when grown as a groundcover or trained to cascade over some rocks, and even down a wall for the tropical effect. It will make an ideal houseplant or an indoor plant in a greenhouse with bright light and in humid conditions. 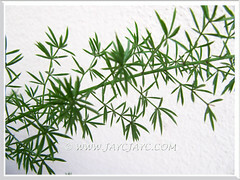 Their delicate and feathery emerald-green foliage are cut and popularly used in bouquets by florists. ‘Myers’ or ‘Meyersii’ (Foxtail Fern, Cat’s Tail Asparagus) – has stiff erect stems with huge plumes of closely set leaves, resembling bottlebrushes or cat’s tail, growing up to 1 meter tall. ‘Flagstaff’ – has long and arching branches like the ‘Sprengeri’ cultivar, up to 1 m long and will be excellent as a groundcover. ‘Mazeppa’ – has very compact dark green foliage, very suitable as a container plant or grown on a sloping garden wall. ‘Cwebe’ – a more upright version of ‘Sprengeri’, it has a very graceful, upright and arching habit, with long needle-like leaves. The only cultivar that dislikes the sun and prefers semi-shade conditions. I also come across a type that forms a bushy type without giving any cascading effect. The foliage appearance are more softer to touch in comparison. I wonder whether these plants are long lasting or only live for a season. We too prefer the Cat’s Tail Asparagus and had planted it before, James. Gave up when it looked sickly. These plants are perennials, long-lasting, unlike annuals.